Our Senior Researcher Markus Dreßler has published an article on Kemalist and post-Kemalist forms of Turkish secularism: "Erdoğan und die "Fromme Generation". Religion und Politik in der Türkei." 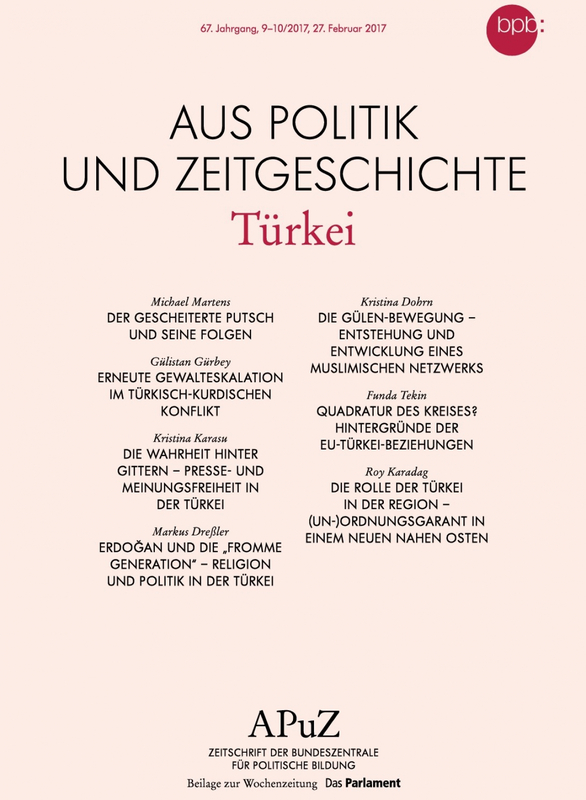 in the current issue on Turkey of the publication "Aus Politik und Zeitgeschichte (From Politics and Contemporary History)" of the Federal Agency for Civic Education (Bundeszentrale für Politische Bildung). The article provides a concise overview of the formation of Turkish secularism from late Ottoman to early Kemalist Republican contexts, and the transformations of Turkish secularism throughout the history of the republic. Particular attention is given to the current religion politics of the AKP, which is discussed in relation to a number of contested and divisive issues (such as the headscarf debate, the question of religious freedom and, related to it, minority rights, as well as the government sponsored Islamization of society). While the article argues that Turkey is currently witnessing a comprehensive overhaul of its political order that marks the end of Kemalism, it also highlights structural continuities between Kemalist and post-Kemalist forms of Turkish secularism.